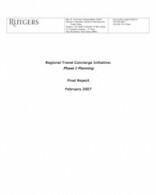 Regional Travel Concierge Initiative: Phase I Planning. Andrea Lubin, 33 pages. A report prepared for the Henry H. Kessler Foundation. February 2007.